When he left rural Lindale, Texas, after graduating high school, Ray Perryman was a National Merit Scholar, the first in his family to attend college and the first male to finish high school. By the time his first exam as a Baylor freshman was graded, Perryman had a job offer to become a college professor. Longtime economics department chair Jim Truitt gave Perryman his first test. "A day or so later Dr. Truitt asked me to come to his office, and I didn't think that was good. I thought he was telling me I needed to go back to East Texas and work in the oil field pipe factory," recalls Perryman. "But he said, 'It'll probably take you four years to graduate, four years to get your Ph.D. At that time, I think I can pay about X number of dollars. What do you think?' Basically he offered me a job after my first economics test. That led me to think I might want to consider a career in economics and math." Perryman credits Truitt and mathematics professor Dr. Vivienne Malone-Mayes, the fifth African American woman ever to receive a doctorate in mathematics, as two of several professors who profoundly influenced him. "I took every class she taught, and I think she made up classes to teach just so I could take them," jokes Perryman, who spoke at Mayes' funeral in 1995. "Vivienne would always say that if your ultimate solution to something wasn't elegant and beautiful, it was probably wrong, and that is something that has really stuck with me over the last 35 years. I've definitely found that to be true," says Perryman. "Mathematical sorts have a different interpretation of what's beautiful, I guess, but if it's not something that fits together nicely and makes sense, then you probably need to keep working." Perryman's success as a student propelled his career down a long and productive path. After Perryman earned his doctorate at Rice, Truitt held true to his word and hired the young scholar to become a professor at Baylor. Perryman went on to receive several teaching awards and became Baylor's Economist-in-Residence, a role he later held at SMU as well. Though he thoroughly enjoyed teaching for 17 years, Perryman's career path ventured more into the research side of economics, to the benefit of millions of citizens in locations around the world. 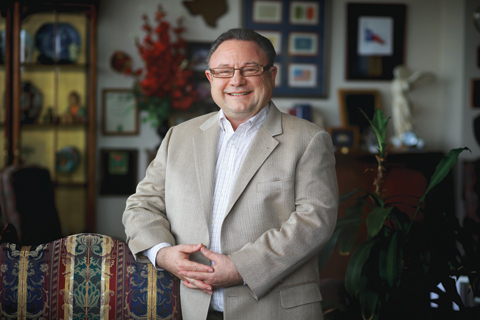 As founder and president of The Perryman Group, an economic and financial analysis firm headquartered in Waco, his complex modeling systems form a basis for corporate and governmental planning around the globe. His thousands of academic and trade articles and presentations span a wide variety of topics, gaining him international respect and acclaim. "I've enjoyed all the research I've been able to do. It's what I do, and I love it. I wake up every day ready to do some more," says Perryman, who has done impact studies for giant projects, such as NAFTA, among his more than 1,300 impact and public policy studies and several hundred other types of studies for companies and other entities. Perryman's economic development study, titled "Texas, Our Texas," was particularly gratifying to him. He says that about 10 years ago, Texas was ranked 37th in the country "in terms of attracting manufacturing and things of that nature. We outlined what we thought needed to be done in a very comprehensive way, and we were fortunate to get the legislature and the leaders of the state to back it and enact it in a very difficult legislative session," he says. "Within the year, we were ranked number one in the country, and we've been number one or two ever since. I was proud to be a part of that entire process." Among Perryman's favorite studies are those that determine the economic impact of the arts. "Normally, people look at attendance at events, what makes people come into town and spend some money and that sort of thing, kind of a traditional approach. We try to take a much broader view of it and say, what do the arts really contribute to society? And what is the creative process worth? We've done some unique things there that have now been used to help create the case for the arts in over half of the U.S. states and over 30 foreign countries." Perryman's long list of accolades includes being named the Nation's Outstanding Young Economist and Social Scientist, Outstanding Young Person in the World in the Field of Economics and Business, Outstanding Texas Leader of 1990, citations from the U.S. Congress, a nominee for the Nobel Prize in Economics, and 2012 Texan of the Year by the Texas Legislative Conference. A popular speaker, he addresses hundreds of audiences throughout the world each year. On his speaking circuit, Perryman enjoys running into his former students. "I'll be in some random place in Texas or somewhere else, and somebody will come up and say, 'I was in your Main Banking class in 1979,' and we'll chat and have a conversation, so those connections I was able to make, I enjoy," he says. As busy as he is, Perryman makes time to help Baylor whenever he can, including recently formulating economic models for the Big 12 Conference, Baylor's new football stadium and serving as a guest speaker in Baylor classes on occasion. He and wife Lorraine have five children, including two Baylor Bears: Skye Lynn Perryman, BA '03, and Bethany Rae Perryman, BA '08. He sees bright days ahead for Baylor. "I've watched the university evolve to where there's really some significant research going on at Baylor right now, and it has impact, yet it has managed to hang on to the priority of quality teaching and quality interaction with the students," he says. "There are not many universities that are in a position to accomplish that as well as Baylor has, and so I think that all speaks very well for the university's future. I think Baylor is playing a productive role in higher education, one of the keys to the long-term future for Texas, the United States, and the world, for that matter."